Can I use one eductor to draw samples from multiple points? An eductor often has the ability to deliver more flow than is required to meet flow rate or time delay for one system. The flow capacity can be divided among two or more sample lines/analyzers. Multiple sample lines can be drawn through a sample switching system or sinultaneously through multiple analyzers/sensors. Can I draw a sample from a point that is at reduced pressure, i.e. less than atmospheric pressure? Because an eductor creates a partial vacuum at the sample intake, these devices can be used to draw samples that are at reduced pressure. Eductors are commonly used to draw stack samples for environmental analysis and to sample furnace exhaust to control combustion efficiency. Can I use a motive pressure at less than the supply pressure? Where can I use an eductor? Sampling: In process analytics for sampling process gases or aspirating stack gases for continuous analysis or for discrete sampling for lab analysis. The eductor can also be configured to return the sample to the process. Can I use process or sample stream as the motive force to drive the eductor? A process stream which is at elevated pressure, e.g. natural gas lines, can be used to drive the eductor. The sample can be diluted at a fixed ratio or returned to the process, depending on the requirements. View typical installation designs. I need to return the sample to a flare header. Can I still use an eductor if there is a backpressure? Backpressure/flow rate curves: The above illustrates the sample or vacuum flow rate vs motive force for three different back pressures at the exhaust. This data is useful when it is necessary to return the sample to the process or to send it to a flare header. The flow rates are shown for 5 psig (blue) backpressure at the exhaust, 10 psig (red) backpressure and 15 psig (green) backpressure. These curves shift significantly higher when an elevated sample pressure exists (see below). This plot illustrates the effect of an elevated sample pressure while experiencing a 15 psig backpressure at the exhaust (atmospheric sample pressure, red; 5 psig elevated sample pressure, blue). 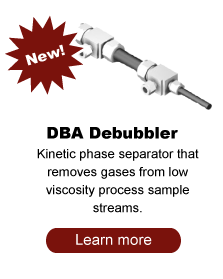 The sample flow rate is significantly increased with the elevated sample pressure. What is the difference between an eductor and an aspirator? 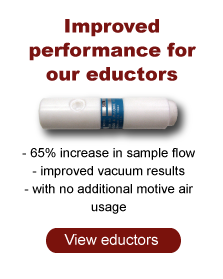 What are the advantages of using an eductor over using a mechanical pump? An eductor is a simple device that has many advantages over a mechanical pump. Compact: Our eductor is built into a tubing Tee with compression fittings and/or threaded ends as integral part of the device. 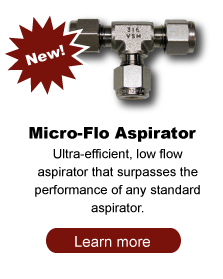 The mini-eductor (or mini-aspirator, Venturi pump) is easily integrated into any sample system. No additional fittings are required. Safety: The Bernoulli vacuum pump or mini-eductor is an intrinsically safe device. 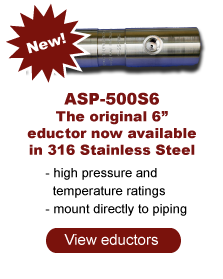 Can I get a mini-eductor in materials other than stainless steel? The standard materials of construction for off-the-shelf eductors are 316 SS and Teflon. Several other metals are also offered (hastalloy, titanium, 316 L, monel, …) depending on process make-up and conditions. For certain low flow requirements ruby or sapphire is utilized in our eductor orifices. Off-the-shelf metal eductors are made from ¼” compression fitting union Tees.